The XLR8 handheld laser uses low-level laser therapy (LLLT) to alter cellular functions and provide noticeable pain relief. Similar to photosynthesis in plants, LLLT has a photochemical effect that naturally reduces oxidative stress and increases the production of ATP. The broad use of the XLR8 laser makes this handheld cold laser an ideal choice for chiropractors, doctors, physical therapists and other professionals who need to treat many conditions such as these in one facility. And with 15 total FDA clearances, no laser manufacturer is more trusted to treat these conditions than Erchonia. New medical uses for LLLT are being researched every day, and more scientific and medical professionals are recognizing the treatment’s many advantages. With a boom in research and popularity, the potential for LLLT in pain relief treatment is limitless. Medical professionals looking for an alternative to pain relief surgery or drugs will find meaningful benefits in treating patients with the XLR8 handheld laser for pain treatment. Unlike drugs — which often have adverse side effects and can potentially become addictive — or traditional pain relief surgery — which frequently involves anesthesia, pain and scarring — the XLR8 laser’s cold laser technology offers pain relief treatment with no side effects, scarring, burning or downtime. Patients have a safer, more pleasant experience while still seeing significant symptom relief. 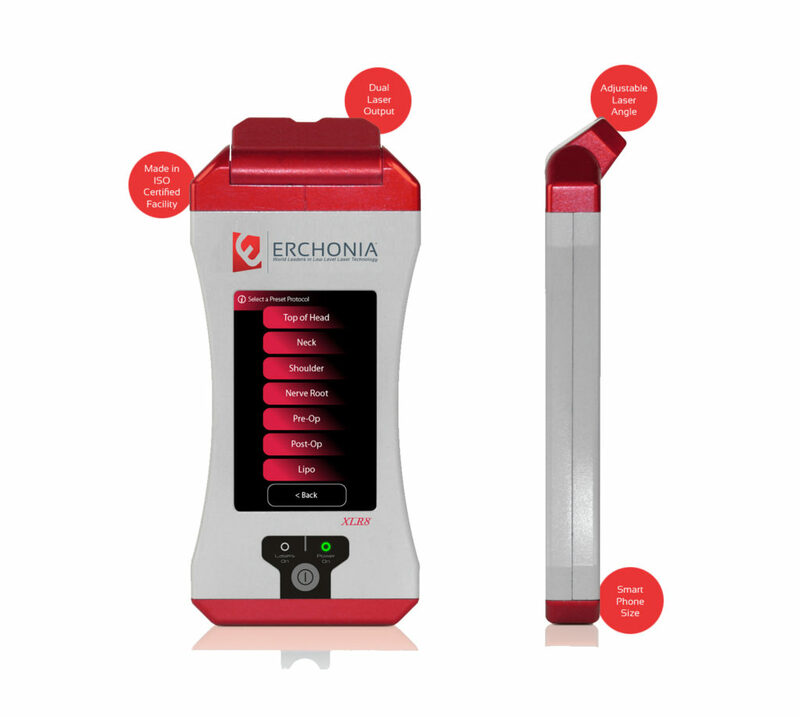 Erchonia’s handheld cold lasers for doctors, chiropractors and other healthcare professionals are also extremely easy to use. The lightweight, cord-free handheld design offers easy portability to transport between rooms or clinics, allowing staff to spend less time setting up equipment and more time on patient care. The intuitive GUI also ensures that anyone can use the device with ease — staff won’t need extensive training to operate this easy-to-use tool. The benefits of handheld cold lasers for health centers are endless, and more medical professionals than ever are finding success in LLLT as an alternative to drugs or surgery. Take advantage of the power of the XLR8 laser today — contact us to order now, or, if you’re a potential patient, search to find a provider near you.